My First Farm: This mode is the one for the novice guys and girls out there who struggle with these games when it comes to just knowing what to do. You're old Grandad pops his clogs, and with you being the only family member out there willing to take over his once successful farm, it's your job to bring back the days when the farm would be bringing in the moolah after now hitting on hard times. Your hand is firmly held here, with the game giving you things to do and telling you where you need to go to do it. While it felt that this was the case for the first hour or so mind you, it did become a little tedious of doing some of the more boring things (ploughing fields being one such thing) the more time on, with the mode feeling like it wasn't really going anywhere at all other than to the next task once you had completed the previous one. Great for the novice, but does begin to feel nothing more than a renamed tutorial mode once you've put a bit of time into it. Challenges: If I've noticed anything in the sim-heavy based review period I've found myself in recently, it's that modes all tend to be the same in games like this. If you read my other review recently (Train Sim World) this is pretty much more of the same when it comes to the modes on offer, only swapping tutorial for the more friendly sounding My First Farm mode spoken about above. This mode is exactly what you think it is, with the four locations on offer in the game all having a certain amount of challenges/scenarios for you to play out and beat. Beat the first one and the second one unlocks for you to try and beat, so on and so on. These are a great fix if you don't want to jump into free-farm for whatever reason, but it is basically doing jobs what you would do in that anyway, only with a reason given for it. One such challenge saw me needing to get my crops collected and stored with a fire on the way. Only thing was, there was no fire to be seen in the distance only a poor attempt at some smoke, so the only real threat was the clock ticking down. So it could have done better in that regard. Free Farm: This is where the person with the knowledge of knowing what how it all works comes to play. With a set amount of money between £25.000 and £200.000, you simply go about building your empire. The four locations to do this are Montana, Columbia, Japan, and Italy, all having their own unique look about them, as well as totally none stereotypical intro music as the map loads up. You choose one to start playing but can also travel between these places by going to the logistics center on the map or by using your tablet and going to the functionalities tab on it, so once you start mastering it a bit better the cash can be coming in from all over the place. You're given a few vehicles to start off with, but other than that the farm is there to be bought and start making money off. Animals, fields, greenhouses are just of the few things littered around to start producing products to make some money, so what you get out of the game is what you put into it. A great mode if you enjoy the genre as you could easily lose hours on it. There is loads to do here, as well as a little side quest of finding sapphires which could earn you a bit of extra cash if you find all of them.You also have a cool little drone to play about with that you can use to buy land and scope out the area with. Overall: Much like any other sim, Pure Farming 2018 won't be for everybody, but it at least tries to allow novices in with the My First Farm mode, even if it does feel like a long-winded tutorial. Putting the effort in here could see you actually making steps into the free-farming mode, and if that's the case you could lose hours here. This said, as with every other game like this it does have downsides too. 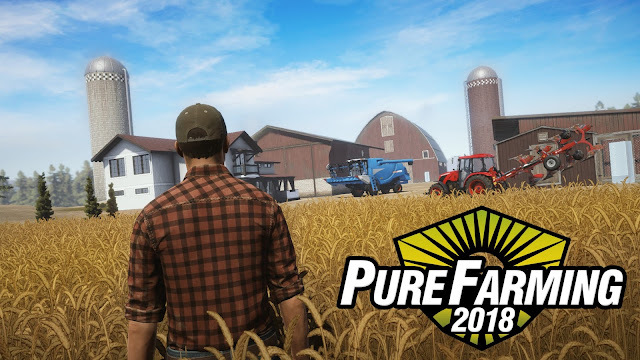 Not being the best looking game is something that always seems to be the case with these games, and Pure Farming 2018 is no different, as it does look like a game running on the 360. If you can look past this though, then Pure Farming 2018 is a decent game to load up and lose a few hours on if you like the genre, perhaps less fun if you've dipped into these games before and got bored very quickly. I don't think it's for me. I can't even get into Stardew Valley and it's very much more my thing. Still, nice that a wide range of genres are now available on console. Interesting to read your thoughts, killin'it a usual!